Hi, Tepples! Yes, I've seen Balloon Kid and that's kinda what I'm thinking. Saw it on Jeremy Parish's youtube show a while ago. Joust controls, but used to navigate levels and unlock doors. Designed more the console play than the arcade action of Joust and Balloon Fight. Reduced the size and design from 40px to 32px across, which means I could line up an enemy of the same size without flicker, I think. I love the smaller sprites. I'll be keeping an eye on this thread. I am insanely jealous of your ability to make tiny three-color sprites not look awful. Excellent stuff. Thanks! Cheers! Gruniożerca 2 is an amazing looking game, btw. 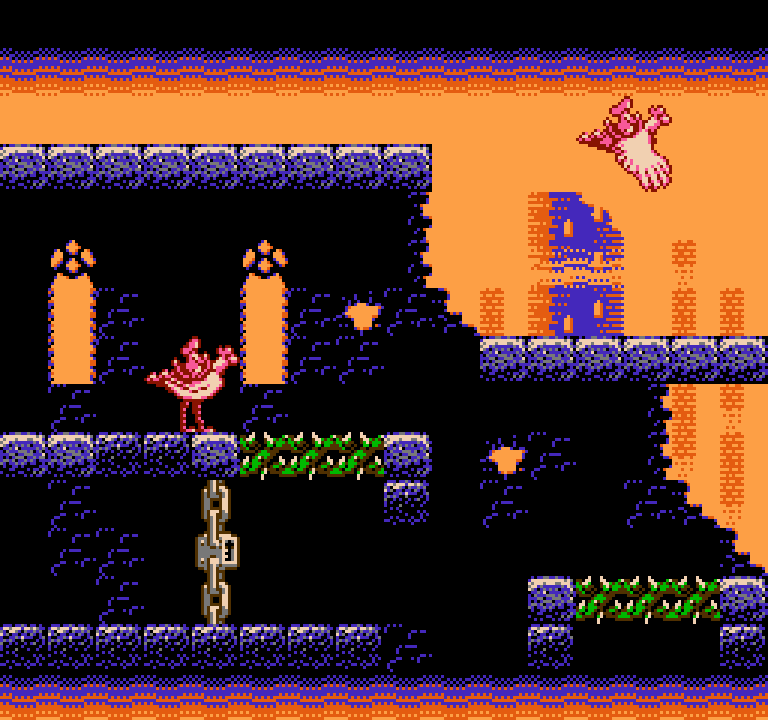 Took a stab at some level tiles for working title Cockatrice. Still need to think about where to fit the hud and what goes on it, but it might be a bit early for that. I'm trying to apply what I've been learning from the art threads here. Yall are so wonderful to share what you know. There are so many awful or unhelpful pixel art tutorials out there, but this please is rich with great info! UPDATE: I just rebuilt this in NESST and it worked perfectly! Success! I think that if the solid blocks or anything in the near-background were given a bit more ’structure’ and/or bolder strokes, and were a bit less noisy from dither, they would stand out more from the dither far background. It also would provide a bit of an anchor for the eye to rest on, whereas if everything is grainy, it can be a bit straining. Another thing to watch out for is that if you scroll the scene, dither will ’dance’ and shimmer. You problably know i like to dither quite a bit myself but it is something to be a bit mindful of. It is also possible to go the other way around: the more far away something is; the less detail. Maybe this approach is helped by thinking of a camera having a focus depth - at what depth do you want focus and at what depth do you want a blur?. As always, it’s a balance and an artistic choice. A good potential with micropatterns and dither is that you can coax more percieved colours out of the master palette with careful placement because of the pixels bleeding into one another. This is good info! Thank you! Thank you! This is a solid critique! I haven't looked at an old TV screen in years, but it's becoming clear that if you are designing for the NES you don't just get its specs, you also get the TVs it would have been hooked up to! Thanks again! Sketching out a castle tile set this morning. Learned a lot on this one about how to blend pallets and how not to leave extra room on the edges of tiles for the background color. Still, this is as done as it needs to be. This was supposed to be a sketch for working title Cockatrice, but it just became way too Castlevania for that. But I was having fun, so I didn't want to stop. Haha. Is there also a henatrice? Haha! I wonder. Maybe there is a Doodledootrice out there too. 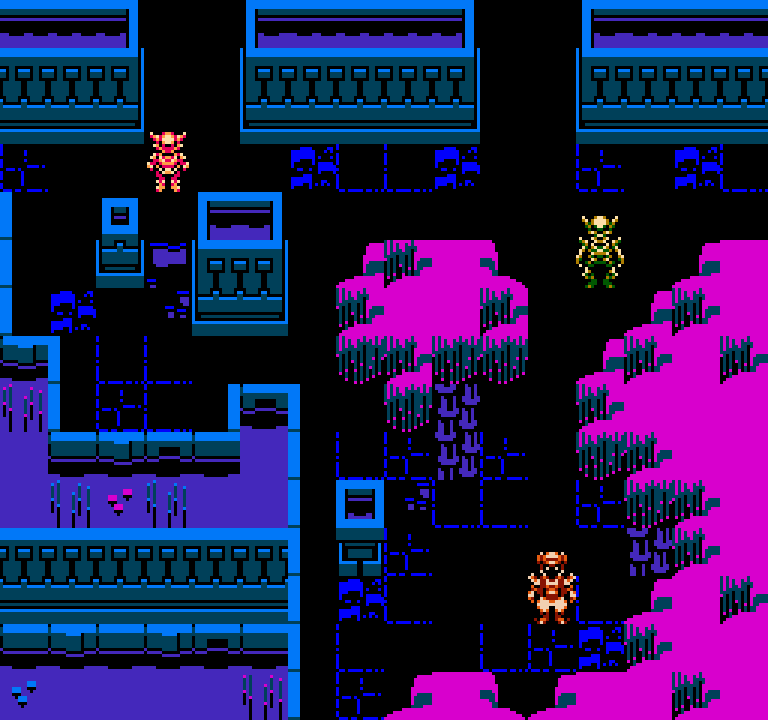 I'm going to see if I can cheat some black into the sprite work by leaving the ground tiles mostly black. We'll see if it looks too janky, but I think it'll give a cool dreamlike effect to the world. You're very productive! Looks nice too. It also has its downsides, but you could maybe temporarily overwrite object-occupied areas with black fillers to avoid the unintentional transparency. Basically: if more than 4 pixel lines or pixel rows are eclipsed by the objects radius, then "mask" it by swapping it. It's primitive, but could work. Or if the amount of bg floor tiles in chr are very few, you could maybe even dedicate some space for a few alternates with pre-rendered masking for a smother effect. The stone tiles don't need too many alternates as they're mostly blank anyway. Thanks, Frankengraphics! I'll see if that something I'm up for. ATM, I hoping that using the darkest blue for the some texture on the ground tiles will let me get away without extra code. A little bit of background detail showing through the dark areas of sprites is not such a big deal... 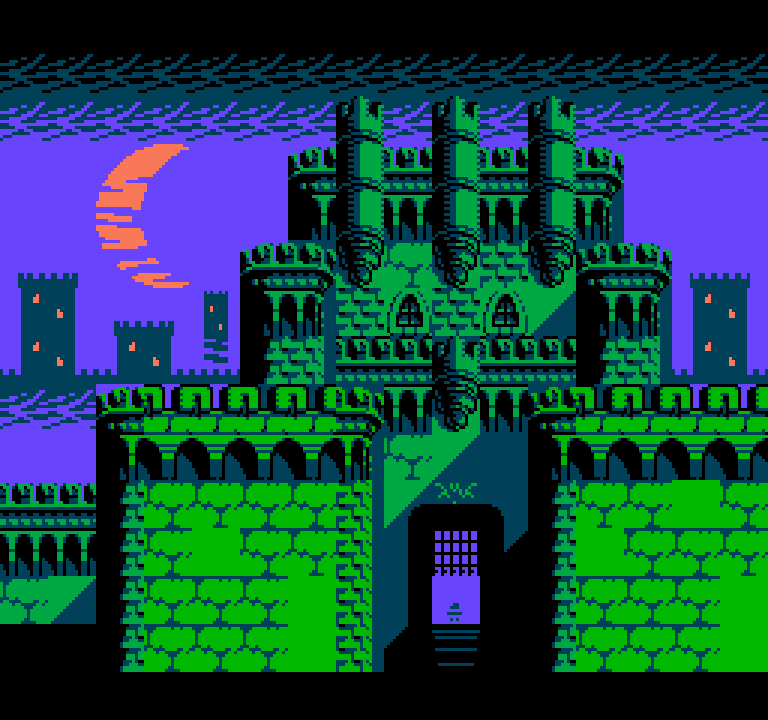 In older systems that had single-color sprites (such as the TMS9918 and whatever the Intellivision used), it was actually common to have A LOT of background showing through. I certainly wouldn't go through the humongous trouble of modifying the background tiles behind sprites as they moved to avoid this effect... If background details showing through was a problem for me, I'd probably not use transparency as black in the first place and stick to 3 colors per sprite. 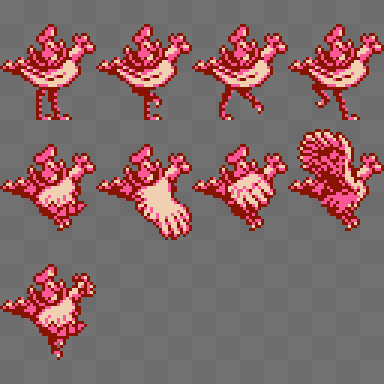 Yeah, tokumaru, if I need to, it'll be easy to fill in the black spots on the sprites. 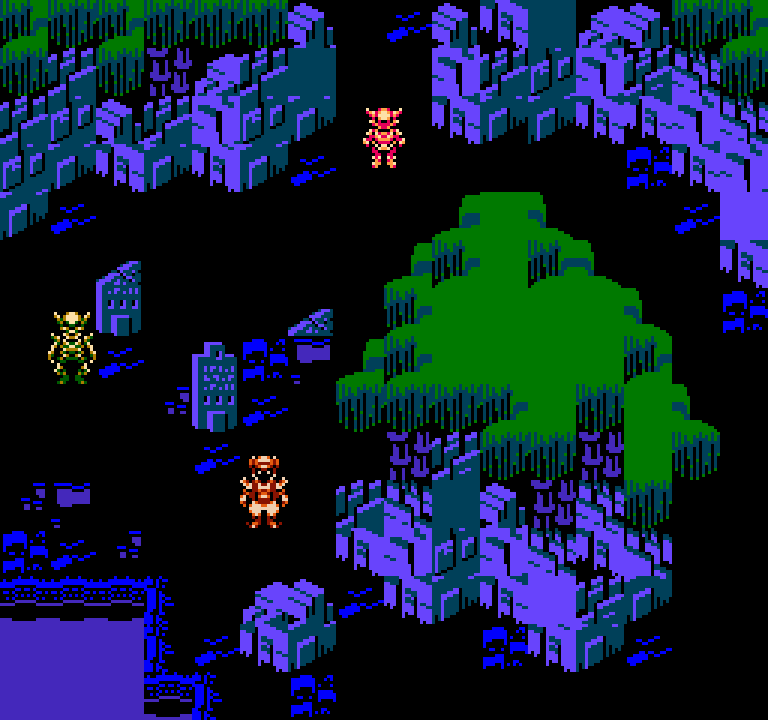 In the meantime, here are some rocky forest cemetery backgrounds.